Whether you’re looking for a security camera to reach a difficult area or want an environmentally friendly option, solar powered security cameras are a great option. Before buying a solar powered security camera, it’s important to understand how they work so that you can make the right decision for your security needs. Our security experts are sharing the answers to the most common questions and benefits of solar powered security cameras. Solar powered security cameras, also commonly referred to as solar panel security cameras harness the sun’s energy to power the compatible security camera. How do solar powered security cameras work? Solar powered security cameras use solar panels to harness the sunlight and convert that sunlight into direct current (DC) electricity. An inverter then transitions the direct current to an alternating current (AC), which can then be used to power the security cameras. What happens when it rains or is overcast – do solar powered security cameras work? Most solar powered cameras also come with an alternative or backup power source, often rechargeable batteries. The solar panel not only powers the security camera but also recharges the batteries. When direct sunlight is not available (i.e. at night or on a rainy day), the solar powered security camera will be powered by the rechargeable batteries. The battery will start charging as soon as there is direct sunlight. Are solar powered cameras waterproof? Yes. As the solar panels and cameras are exposed to the elements, they must be weatherproof. In addition to the weatherproof panel, Swann’s compatible Smart Security Camera can withstand snow, rain, dust, and direct sunlight keeping your property protected year round. The main advantage of solar powered security cameras is charging the battery powered camera creating a renewable power source. 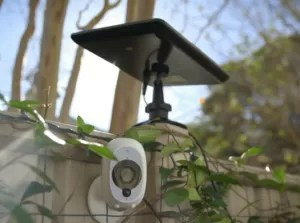 Although a Wi-Fi connection is required, these cameras can be used for harder to access areas of your home, such as the roof (pending a Wi-Fi signal). For the locations not suited to a wired, cabled security system, solar powered security cameras provide the option of a reliable security system without the hassle and added expense of running cables. Scalable solution that can be easily adjusted to meet your future needs – can add as many solar panels as cameras. Solar powered security cameras have many benefits that make them an advantageous security option. 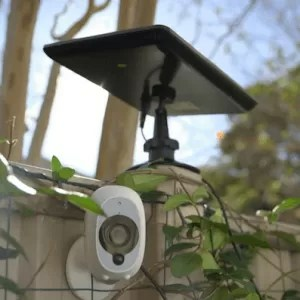 Swann’s Solar Panel for the Smart Security Camera leverages solar charging technology and features an outdoor/indoor weather resistant construction. It is compatible with the Smart Security Camera, a wire-free 1080p full HD wireless security camera with infrared heat-sensing, night vision, and is compatible with voice commands via Amazon Alexa™.